Make your dog a "Phi Barka Kappa!" 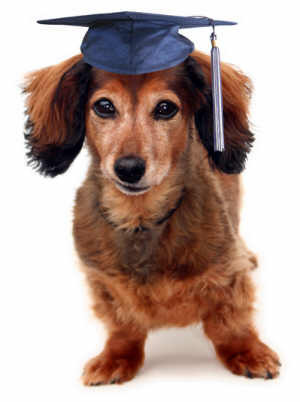 Your dog can achieve his/her degree at Paws-i-tive Behavior which offers group classes and private lessons. Paws-I-tive Behavior serves Rochester, NY and surrounding Monroe, Ontario and Wayne Counties. The company through it's owner, Fran Schoenfeld, teaches a method of positive reinforcement using praise and reward. Fran teaches dog guardians how dogs process information which provides the basis for learning the skills required to promote effective communication between you and your dog. In other words, she teaches you how to "think dog." Fran's techniques include the promotion of a dog’s socialization skills at an early age. This helps the dog's maturation process,insures positive interactions with other dogs, promotes desirable exercise through dog play and helps to minimize a dog’s loss of focus on its guardian when other dogs are in the vicinity. These techniques help dog guardians become part of the training process and provide them with the tools to prevent future behavior problems. “Positive Reinforcement” is the same training method used by renowned dog trainer, Victoria Stilwell, who stars in the Animal Planet show, "It's Me or The Dog". Fran and Victoria, who got together at a local dog training facility, are shown at the right. Private lessons provide more focused training, and are recommended for dogs with behavioral issues. They also provide other members of the family the opportunity to learn the training techniques. This is critically important in the successful training of a dog, since all members of a family must be consistent in their interactions with the dog. The photo on the right shows Fran getting her client's attention as she prepares to administer the necessary training procedures. Fran teaches these skills in two formats: group classes and private lessons, each with their own set of advantages. Group classes provide the advantages of puppy/dog socialization within the group, observing how training tools work with other dogs, and the chance to hear Fran respond to situations that other dog guardians have encountered with their dogs. The photo to the left shows Fran conducting a group class at Perinton Community Center. Photos of her students from the most recent classes can be seen on the Class Photo page of this website. The dates, times, and other details of Fran’s upcoming group classes, along with registration information, can be found on the Class Information page. site visitors are the Paws-E-Bytes page which provides training and dog health maintenance tips and the Events page which tells of special community events that Pawsitive Behavior is sponsoring or participating in. The Contact page provides the information for getting in touch with Fran and the facilities in which she provides her group classes. LOCAL DISTRIBUTOR OF "FREEDOM" & "EASY WALK" HARNESSES.